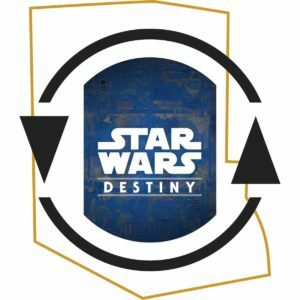 Learning Destiny is a series of tutorial videos and blogs designed to teach the Star Wars: Destiny Collectible Card and Dice Game. This guide is updated continuously to provide the most current information. 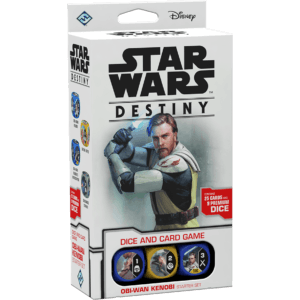 The easiest way to understand everything you need to know to buy Star Wars: Destiny is by watching our buyers guide video below! Unquestionably, the best place to start with Star Wars: Destiny is picking up a few starters. As unintuitive as it seems, you’ll want to pick up two copies of the starters that interest you the most to build a reasonable deck. A single starter experience is fine for learning the game, but doesn’t give you enough for a full, 30-card deck. The 2-Player Starter offers the best experience out of the box and buying two copies of it will allow you to build two similarly powered decks centered around Rey and Kylo Ren. We also use the 2-Player starter as a jumping off point for the rest of the chapters in this series, so it’s helpful to follow along! We also recommend grabbing two copies of whichever starter characters interest you the most! These starters are in and out of print, but we will include the active and available starters below. Before moving past the starters, it is important to understand what makes Destiny a collectible game. Not every Destiny card is as common as the next, a concept known as rarity. The rarity of a card indicates how likely it is to appear in a booster pack. These rarities are indicated on the bottom right of a card (see below) and include, from most common to least common: common (blue), uncommon (yellow), rare (green), and legendary (purple). The exception here are starter cards (gray), which only appear in starter products and are never random (every Boba Fett Starter is identical, every Two-Player Game is identical, etc). Now, if you have never played a collectible game, this next part part might get a little confusing. Stick with us, we got you. Every card in Destiny belongs to a specific set. You can see it on the bottom right of the card. On Vader’s Fit above, for instance, the bottom right of the card tells us that it belongs to the set represented by a Galaxy icon (in this case, Across the Galaxy), that it is card #13 in that set, and that it is legendary (purple). So every card in the game has a rarity and belongs to a certain set. Makes sense, right? Now, how to acquire those non-Starter cards! Each set has what are called booster packs that contain cards exclusively from that set. For example, there are Awakenings booster packs, Spirit of Rebellion booster packs, Empire at War booster packs, and so on. Each booster pack contains five cards and a die, with 1 random rare or legendary (with a matching die), 1 random uncommon, and 3 random commons from its corresponding set. These booster packs (see above) are packaged into booster boxes, also known as booster displays or gravity feeds. Each booster box contains 36 booster packs and is almost entirely guaranteed to contain 6 booster packs with a legendary card inside. The booster box is the primary means for distributing the game. 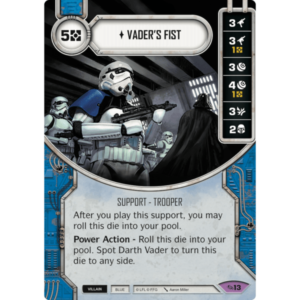 If you want to move beyond Starter cards and dive into the robust, customizable world of Star Wars: Destiny (which you absolutely should), the next step is generally to buy one or two booster boxes from the most recent set. The current set will be legal for the longest amount of time, (generally) most readily available, and most desired by other players – so trading and/or selling is easier. The booster box for the most recent set is below! But wait – what if there was a way to “buy a booster box” in a much more efficient and cost-effective way? What if you could make a game of it and create new friends at the same time? 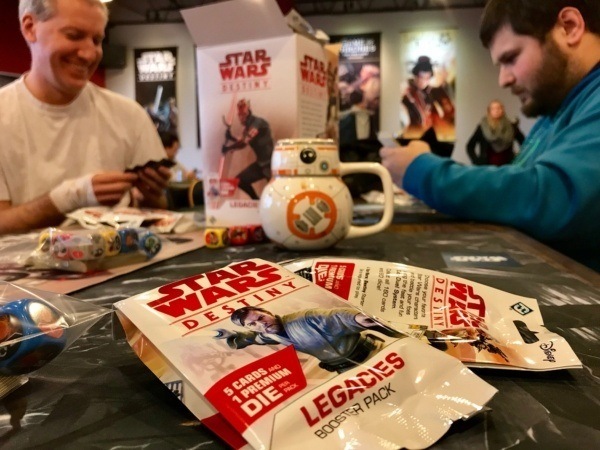 The Draft format of Star Wars: Destiny is undoubtedly our suggested path forward once you decide to go further with the game. You buy a single Draft Starter (which you will use over and over again) and then play in Draft events, collecting cards along the way. Playing in a Draft is similar to other types of “drafts”, like fantasy football. There is a big pool of cards shared among a group of players, and those players take turns picking one card for their deck until there are no cards left. In practice, every player opens three booster packs and places the stack of fifteen cards in front of them (five from each pack). Each player chooses one card from the stack and then passes the rest of the cards to the player on their left. Each player now chooses one of the fourteen remaining cards in the stack that was just passed to them, and then passes the remaining thirteen to the left. This continues until all fifteen cards are drafted – take a card, pass, take a card, pass, take a card, pass – then the same things happens again, but this time you pass cards to the right. After all of the packs have been drafted, you construct a deck using all of the cards you chose combined with the contents of your Draft Starter, and then play a little mini tournament. The winner often gets additional booster packs, making Draft an even better deal! So not only do you get to open packs in a fun way, meet other people, and play an incredibly enjoyable, fundamental version of Star Wars: Destiny, but you also get to actively select the cards that are most needed for your collection. It is the ideal way to move past the Starters. If this sounds like how you would like to explore the game and expand your collection, you can skip to Everything You Need To Know About Drafting! Finally, when there are only a few cards in the current set that you need, trading with other players or buying singles is usually the best way to go. Instead of continuing to roll the dice, hoping for that one Legendary that you are missing, just get the exact card(s) and be done with it. Trading is a common part of collectible games, so no one will look at you funny if you walk up and say “I need card X. Do you have it? I have plenty to trade.” In fact, it is often the beginning of entire friendships! If you do not have other players to trade with or are simply not interested in that aspect of collectible games, many sites, like ours, sell singles. You simply buy the exact cards that you want. Once you have some cards from the most recent set, hopefully by drafting with a local community or hosting your own, your next consideration is getting on top of the next set. While you might be tempted to start collecting older cards, it is very much in your benefit to be a part of the early frenzy that is a new set release. As soon as a new set drops, everyone is buying, selling, and trading those cards, so it is the best time to acquire what you need. When locking down the upcoming set, there are a few options, and many combinations among them. Pre-order booster boxes – This is the standard, tried and true way of making sure you have the cards you need from the upcoming set. Dedicated players will usually buy three to six booster boxes and hope to get the cards needed to end up with two of every legendary after trading/selling/buying what they are missing (there are 17 legendaries in a set, and six boxes yields 36 legendary cards). Distribution of course is random, and all too often this strategy leads to 8 of one Legendary and not a single copy of others. This is why trading is important for the all-in booster box approach. Other players settle on three booster boxes as the magic number, since it gets them 18 legendary cards – enough to have a shot at getting one of every legendary in the set after trading duplicates and other rares. This strategy is usually supplemented by a Saga Set, singles, or the occasional draft. And of course, a lot of players enjoy pre-ordering a single booster box to open on release, and then supplement it with future booster box purchases, a Saga Set, or extensive drafting over time. 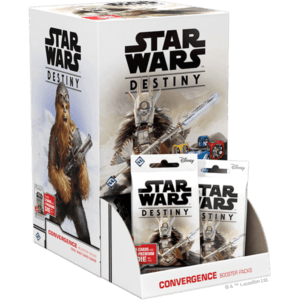 Start a Booster Box Subscription – Recognizing the inconvenience of pre-ordering every set and keeping up with release dates, we added a Star Wars: Destiny Booster Box Subscription to our Covenant Subscriptions service. Having a subscription is like automatically pre-ordering booster boxes for every new set, except you are not charged until a few weeks before the set releases, and they arrive very close to release day (we aim for delivery ON release day) instead of a week or more later. Not only does a subscription save you a lot of time and guarantee you get the new set as soon as it is released, boxes through the subscription are also priced as low as is allowed (a concept known as “minimum advertised price”) and shipping is free when you subscribe to two or more boxes. This means you will pay $86.12 for your boxes instead of the MSRP of $107.64, and with at least two boxes in your subscription, it all ships completely free. Pre-order a Saga Set (or two!) – Saga Sets offer another unique and easy way to keep up with the game. Every Saga Set contains 1x every Legendary card in the set, and 2x every Rare, Uncommon, and Common card. Instead of dealing with the collectible, booster pack aspect of the game, you can skip it entirely and just buy a complete set outright. 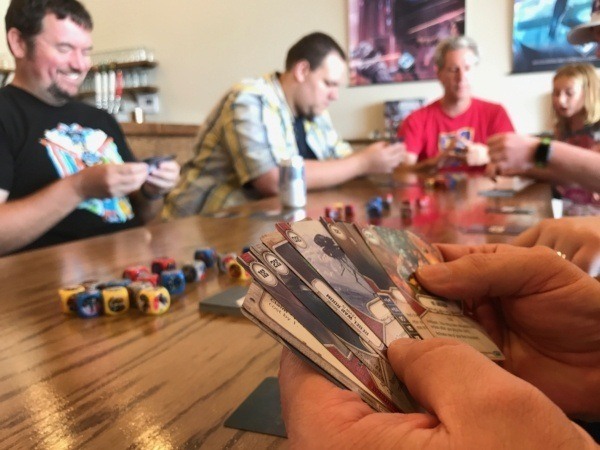 This makes Destiny function more like an expandable board game or Living Card Game – when the new expansion comes out, you buy it and that is the end of it! Saga Set buyers love that they do not have to chase down cards and buy a bunch of random packs in order to find the one thing that they are missing. A lot of players are also not interested in trading as actively as is necessary to complete their collections, and so opt for the convenience of the Saga Set instead. Remember that every character can be run as an elite, which means you need two copies of the card/die to do so. A Saga Set has one copy of every Legendary, so some players buy two Saga Sets to completely cover their bases. More commonly, those additional Legendaries are picked up by trading off cards from the Saga Set that are unwanted (if you are playing Hero and do not need the Villain cards, for instance) or opening a booster box locally and, of course, drafting! Once you feel satisfied with the cards you have from the current set (by drafting, trading, and buying packs and/or singles) and are setup to get a jump start on the next set (by pre-ordering boxes, starting a Booster Box Subscription, or pre-ordering a Saga Set), you can always catch up on previous sets. The best way to do so is entirely dependent on what is out there and your needs. If you just need a few characters or key cards from previous sets, singles are the way to go. If you want to build a full collection, look for discounted booster boxes or even full collections on eBay or the Star Wars: Destiny marketplace on Facebook. And if you have a local community, players are often very willing to trade a lot of old cards in order to get a card or two from the newest set, so this is a good option if you have extras. No matter the method, be aware that older sets do rotate out of standard play. The video at the top of this page describes this in great detail, but put simply, the older the set, the more likely it has already rotated out – and if it has not, it will soon. You can learn more about rotation on Fantasy Flight’s website to make sure that you do not unknowingly buy cards that you cannot use. Understanding how to buy a collectible game is often just as confusing as the game itself. 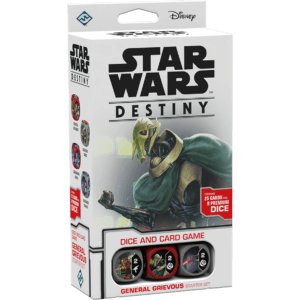 We hope that this guide helped clarify what to buy and where to start looking for Star Wars: Destiny products. This is likely the hardest part of the entire series, so, well, you made it! In the next chapter, we dive into moving beyond the starers and building your first deck!